This document covers the setup options and parameters for Geo clusters and their components, such as booth ticket manager, the specific Csync2 setup, and the configuration of the required cluster resources (and how to transfer them to other sites in case of changes). Learn how to monitor and manage Geo clusters from command line or with the Hawk2 Web interface. Copyright © 2006–2018 SUSE LLC and contributors. All rights reserved. How to make sure that a cluster site is up and running? How to make sure that resources are only started once? How to make sure that quorum can be reached between the different sites and a split-brain scenario can be avoided? How to keep the CIB up to date on all nodes and sites? How to manage failover between the sites? How to deal with high latency in case of resources that need to be stopped? In the following sections, learn how to meet these challenges with SUSE Linux Enterprise High Availability Extension. Geo clusters based on SUSE® Linux Enterprise High Availability Extension can be considered “overlay” clusters where each cluster site corresponds to a cluster node in a traditional cluster. The overlay cluster is managed by the booth cluster ticket manager (in the following called booth). Each of the parties involved in a Geo cluster runs a service, the boothd. It connects to the booth daemons running at the other sites and exchanges connectivity details. For making cluster resources highly available across sites, booth relies on cluster objects called tickets. A ticket grants the right to run certain resources on a specific cluster site. Booth guarantees that every ticket is granted to no more than one site at a time. If the communication between two booth instances breaks down, it might be because of a network breakdown between the cluster sites or because of an outage of one cluster site. In this case, you need an additional instance (a third cluster site or an arbitrator) to reach consensus about decisions (such as failover of resources across sites). Arbitrators are single machines (outside of the clusters) that run a booth instance in a special mode. Each Geo cluster can have one or multiple arbitrators. The most common scenario probably is a Geo cluster with two sites and a single arbitrator on a third site. This requires three booth instances. It is also possible to run a two-site Geo cluster without an arbitrator. In this case, a Geo cluster administrator needs to manually manage the tickets. If a ticket should be granted to more than one site at the same time, booth displays a warning. The following list explains the components and mechanisms for Geo clusters in more detail. Each site runs one booth instance that is responsible for communicating with the other sites. If you have a setup with an even number of sites, it is useful to have an additional instance to reach consensus about decisions such as failover of resources across sites. In this case, add one or more arbitrators running at additional sites. Arbitrators are single machines that run a booth instance in a special mode. As all booth instances communicate with each other, arbitrators help to make more reliable decisions about granting or revoking tickets. Arbitrators cannot hold any tickets. A network failure between A and B. However, if site C (the arbitrator) can still communicate with site B, site B must still be up and running. Booth is the instance managing the ticket distribution, and thus, the failover process between the sites of a Geo cluster. Each of the participating clusters and arbitrators runs a service, the boothd. It connects to the booth daemons running at the other sites and exchanges connectivity details. After a ticket has been granted to a site, the booth mechanism can manage the ticket automatically: If the site that holds the ticket is out of service, the booth daemons will vote which of the other sites will get the ticket. To protect against brief connection failures, sites that lose the vote (either explicitly or implicitly by being disconnected from the voting body) need to relinquish the ticket after a time-out. Thus, it is made sure that a ticket will only be redistributed after it has been relinquished by the previous site. See also Dead Man Dependency (loss-policy="fence"). For a Geo cluster with two sites and arbitrator, you need 3 booth instances: one instance per site plus the instance running on the arbitrator. The upper limit is (currently) 16 booth instances. After a ticket is revoked, it can take a long time until all resources depending on that ticket are stopped, especially in case of cascaded resources. To cut that process short, the cluster administrator can configure a loss-policy (together with the ticket dependencies) for the case that a ticket gets revoked from a site. If the loss-policy is set to fence, the nodes that are hosting dependent resources are fenced. On the one hand, loss-policy="fence" considerably speeds up the recovery process of the cluster and makes sure that resources can be migrated more quickly. Data lying on shared storage. 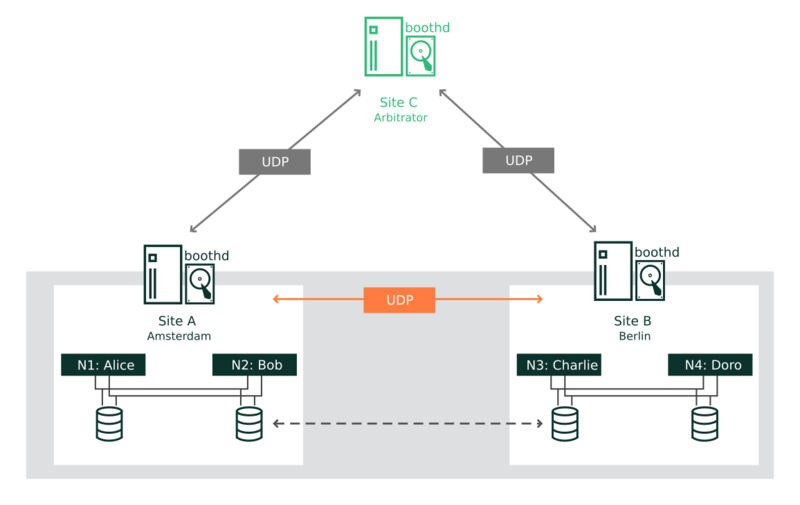 Data in a replicating database (for example, MariaDB or PostgreSQL) or on a replicating device (DRBD), where the data has not yet reached the other site because of a slow network link. A ticket grants the right to run certain resources on a specific cluster site. A ticket can only be owned by one site at a time. Initially, none of the sites has a ticket—each ticket must be granted once by the cluster administrator. After that, tickets are managed by the booth for automatic failover of resources. But administrators may also intervene and grant or revoke tickets manually. After a ticket is administratively revoked, it is not managed by booth anymore. For booth to start managing the ticket again, the ticket must be again granted to a site. Resources can be bound to a certain ticket by dependencies. Only if the defined ticket is available at a site, the respective resources are started. Vice versa, if the ticket is removed, the resources depending on that ticket are automatically stopped. The presence or absence of tickets for a site is stored in the CIB as a cluster status. With regard to a certain ticket, there are only two states for a site: true (the site has the ticket) or false (the site does not have the ticket). The absence of a certain ticket (during the initial state of the Geo cluster) is not treated differently from the situation after the ticket has been revoked. Both are reflected by the value false. 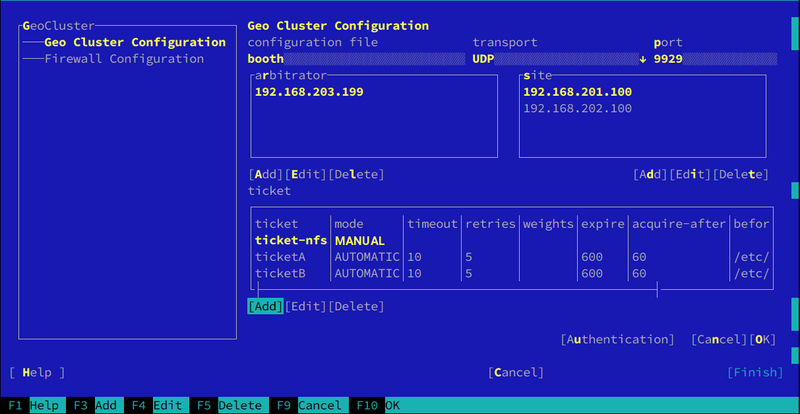 A ticket within an overlay cluster is similar to a resource in a traditional cluster. But in contrast to traditional clusters, tickets are the only type of resource in an overlay cluster. They are primitive resources that do not need to be configured or cloned. After you have initially granted an automatic ticket to a site, booth will manage this ticket automatically. If the site holding a ticket should be out of service, the ticket is automatically revoked after the expiry time. If the remaining sites have quorum, the ticket will be granted to another site (fail over). The resources that depend on that ticket fail over to the new site that holds the ticket. The loss-policy (which is defined within the constraint) specifies what happens to the nodes that have run the resources before. If automatic failover in case of a split brain scenario is not required, administrators can also grant manual tickets to the healthy site. How to manage tickets from command line is described in Section 8.1. When installing the machines, select HA GEO Node as system role. This leads to the installation of a minimal system where the packages from the pattern Geo Clustering for High Availability (ha_geo) are installed by default. The virtual IPs to be used for each cluster site must be accessible across the Geo cluster. The sites must be reachable on one UDP and TCP port per booth instance. That means any firewalls or IPsec tunnels in between must be configured accordingly. Other setup decisions may require to open more ports (for example, for DRBD or database replication). All cluster nodes on all sites should synchronize to an NTP server outside the cluster. For more information, see the Administration Guide for SUSE Linux Enterprise Server 15, available at http://www.suse.com/documentation/sles. Refer to the chapter Time Synchronization with NTP. If nodes are not synchronized, log files and cluster reports are very hard to analyze. Use an uneven number of sites in your Geo cluster. In case the network connection breaks down, this makes sure that there still is a majority of sites (to avoid a split brain scenario). In case you have an even number of cluster sites, use an arbitrator for handling automatic failover of tickets. If you do not use an arbitrator, you need to handle ticket failover manually. The cluster on each site has a meaningful name, for example: amsterdam and berlin. This chapter describes the setup and configuration options for booth, how to synchronize the booth configuration to all sites and arbitrators, how to enable and start the booth services, and how to reconfigure booth while its services are running. The default booth configuration is /etc/booth/booth.conf. This file must be the same on all sites of your Geo cluster, including the arbitrator or arbitrators. To keep the booth configuration synchronous across all sites and arbitrators, use Csync2, as described in Section 4.5, “Synchronizing the Booth Configuration to All Sites and Arbitrators”. The directory /etc/booth and all files therein need to belong to the user hacluster and the group haclient. Whenever you copy a new file from this directory, use the option -p for the cp command to preserve the ownership. Alternatively, when you create a new file, set the user and group afterward with chown hacluster:haclient FILE. For setups including multiple Geo clusters, it is possible to “share” the same arbitrator (as of SUSE Linux Enterprise High Availability Extension 12). By providing several booth configuration files, you can start multiple booth instances on the same arbitrator, with each booth instance running on a different port. That way, you can use one machine to serve as arbitrator for different Geo clusters. For details on how to configure booth for multiple Geo clusters, refer to Section 4.4, “Using a Multi-Tenant Booth Setup”. To prevent malicious parties from disrupting the booth service, you can configure authentication for talking to booth, based on a shared key. For details, see 5 in Example 4.1, “A Booth Configuration File”. All hosts that communicate with various booth servers need this key. Therefore make sure to include the key file in the Csync2 configuration or to synchronize it manually across all parties. Automatic tickets are controlled by the boothd daemon. Manual tickets are managed by the cluster administrator only. Automatic and manual tickets can be defined together. You can define and use both automatic and manual tickets within the same Geo cluster. Manual ticket management remains manual. The automatic ticket management is not applied to manually controlled tickets. Manual tickets do not require any quorum elections, cannot fail over automatically, and do not have an expiry time. Manual tickets will not be moved automatically. Tickets which were manually granted to a site will remain there until they are manually revoked. Even if a site goes offline, the ticket will not be moved to another site. This behavior ensures that the services that depend on a ticket remain on a particular site and are not moved to another site. Same commands for managing both types of tickets. The manual tickets are managed by the same commands as automatic tickets (grant or revoke, for example). Arbitrators are not needed if only manual tickets are used. If you configure only manual tickets in a Geo cluster, arbitrators are not necessary, because manual ticket management does not require quorum decisions. To configure tickets, use the /etc/booth/booth.conf configuration file (see Section 4.3, “Using the Default Booth Setup” for further information). If you have set up your basic Geo cluster with the ha-cluster-bootstrap scripts as described in the Geo Clustering Quick Start, the scripts have created a default booth configuration on all sites with a minimal set of parameters. To extend or fine-tune the minimal booth configuration, have a look at Example 4.1 or at the examples in Section 4.4, “Using a Multi-Tenant Booth Setup”. To add or change parameters needed for booth, either edit the booth configuration files manually or use the YaST Geo Cluster module. To access the YaST module, start it from command line with yast2 geo-cluster (or start YaST and select High Availability › Geo Cluster). The transport protocol used for communication between the sites. Only UDP is supported, but other transport layers will follow in the future. Currently, this parameter can therefore be omitted. The port to be used for communication between the booth instances at each site. When not using the default port (9929), choose a port that is not already used for different services. Make sure to open the port in the nodes' and arbitrators' firewalls. The booth clients use TCP to communicate with the boothd. Booth will always bind and listen to both UDP and TCP ports. The IP address of the machine to use as arbitrator. Add an entry for each arbitrator you use in your Geo cluster setup. The IP address used for the boothd on a site. Add an entry for each site you use in your Geo cluster setup. Make sure to insert the correct virtual IP addresses (IPaddr2) for each site, otherwise the booth mechanism will not work correctly. Booth works with both IPv4 and IPv6 addresses. If you have set up booth with the ha-cluster-bootstrap scripts, the virtual IPs you have specified during setup have been written to the booth configuration already (and have been added to the cluster configuration, too). To set up the cluster resources manually, see Section 6.2, “Configuring a Resource Group for boothd”. Optional parameter. Enables booth authentication for clients and servers on the basis of a shared key. This parameter specifies the path to the key file. The key can be either binary or text. If it is text, the following characters are ignored: leading and trailing white space, new lines. The key must be between 8 and 64 characters long. The key must belong to the user hacluster and the group haclient. The key must be readable only by the file owner. The tickets to be managed by booth or a cluster administrator. For each ticket, add a ticket entry. For example, the ticket ticket-nfs specified here can be used for failover of NFS and DRBD as explained in http://www.suse.com/documentation/suse-best-practices/sbp-drbd/data/sbp-drbd.html. Optional parameter. Defines the ticket mode. By default, all tickets are managed by booth. To define tickets which are managed by the administrator (manual tickets), set the mode parameter to MANUAL or manual. Manual tickets do not have expire, renewal-freq, and retries parameters. Optional parameter. Defines the ticket's expiry time in seconds. A site that has been granted a ticket will renew the ticket regularly. If booth does not receive any information about renewal of the ticket within the defined expiry time, the ticket will be revoked and granted to another site. If no expiry time is specified, the ticket will expire after 600 seconds by default. The parameter should not be set to a value less than 120 seconds. The default value set by the ha-cluster-init scripts is 600. Optional parameter. Defines a timeout period in seconds. After that time, booth will resend packets if it did not receive a reply within this period. The timeout defined should be long enough to allow packets to reach other booth members (all arbitrators and sites). Optional parameter. Defines how many times booth retries sending packets before giving up waiting for confirmation by other sites. Values smaller than 3 are invalid and will prevent booth from starting. Optional parameter. Sets the ticket renewal frequency period. Ticket renewal occurs every half expiry time by default. If the network reliability is often reduced over prolonged periods, it is advisable to renew more often. Before every renewal the before-acquire-handler is run. Optional parameter. It supports one or more scripts. To use more than one script, each script can be responsible for different checks, like cluster state, data center connectivity, environment health sensors, and more. Store all scripts in the directory /etc/booth.d/TICKET_NAME and make sure they have the correct ownership (user hacluster and group haclient). Assign the directory name as a value to the parameter before-acquire-handler. The scripts in this directory are executed in alphabetical order. All scripts will be called before boothd tries to acquire or renew a ticket. For the ticket to be granted or renewed, all scripts must succeed. The semantics are the same as for a single script: On exit code other than 0, boothd relinquishes the ticket. Assume that the /etc/booth.dTICKET_NAME directory contains the service-runnable script. This simple script is based on crm_simulate. It can be used to test whether a particular cluster resource can be run on the current cluster site. That means, it checks if the cluster is healthy enough to run the resource (all resource dependencies are fulfilled, the cluster partition has quorum, no dirty nodes, etc.). For example, if a service in the dependency-chain has a failcount of INFINITY on all available nodes, the service cannot be run on that site. In that case, it is of no use to claim the ticket. The resource to be tested by the before-acquire-handler (in this case, by the service-runnable script). You need to reference the resource that is protected by the respective ticket. In this example, resource db-1 is protected by ticketA whereas db-8 is protected by ticketB. The resource for DRBD (ms_drbd_nfs) is protected by the ticket ticket-nfs. Optional parameter. After a ticket is lost, booth will wait this time in addition before acquiring the ticket. This is to allow for the site that lost the ticket to relinquish the resources, by either stopping them or fencing a node. A typical delay might be 60 seconds, but ultimately it depends on the protected resources and the fencing configuration. The default value is 0. If you are unsure how long stopping or demoting the resources or fencing a node may take (depending on the loss-policy), use this parameter to prevent resources from running on two sites at the same time. Log in to a cluster node as root or equivalent. Edit /etc/booth/booth.conf according to Example 4.1, “A Booth Configuration File”. Verify your changes and save the file. On all cluster nodes and arbitrators, open the port in the firewall that you have configured for booth. See Example 4.1, “A Booth Configuration File”, position 2. Start the YaST Geo Cluster module. Configuration File. A name for the booth configuration file. YaST suggests booth by default. This results in the booth configuration being written to /etc/booth/booth.conf. Only change this value if you need to set up multiple booth instances for different Geo clusters as described in Section 4.4, “Using a Multi-Tenant Booth Setup”. Transport. The transport protocol used for communication between the sites. Only UDP is supported, but other transport layers will follow in the future. See also Example 4.1, “A Booth Configuration File”, position 1. Port. The port to be used for communication between the booth instances at each site. See also Example 4.1, “A Booth Configuration File”, position 2. Arbitrator. The IP address of the machine to use as arbitrator. See also Example 4.1, “A Booth Configuration File”, position 3. To specify an Arbitrator, click Add. In the dialog that opens, enter the IP address of your arbitrator and click OK.
Site. The IP address used for the boothd on a site. See also Example 4.1, “A Booth Configuration File”, position 4. To specify a Site of your Geo cluster, click Add. In the dialog that opens, enter the IP address of one site and click OK. Ticket. The tickets to be managed by booth or a cluster administrator. See also Example 4.1, “A Booth Configuration File”, position 6. To specify a Ticket, click Add. In the dialog that opens, enter a unique Ticket name. If you need to define multiple tickets with the same parameters and values, save configuration effort by creating a “ticket template” that specifies the default parameters and values for all tickets. To do so, use __default__ as Ticket name. Authentication. To enable authentication for booth, click Authentication and in the dialog that opens, activate Enable Security Auth. If you already have an existing key, specify the path and file name in Authentication file. To generate a key file for a new Geo cluster, click Generate Authentication Key File. The key will be created and written to the location specified in Authentication file. Additionally, you can specify optional parameters for your ticket. For an overview, see Example 4.1, “A Booth Configuration File”, positions 7 to 15. Click OK to close the current booth configuration screen. YaST shows the name of the booth configuration file that you have defined. Before closing the YaST module, switch to the Firewall Configuration category. To open the port you have configured for booth, enable Open Port in Firewall. The firewall setting is only applied to the current machine. It will open the UDP/TCP ports for all ports that have been specified in /etc/booth/booth.conf or any other booth configuration files (see Section 4.4, “Using a Multi-Tenant Booth Setup”). Click Finish to confirm all settings and close the YaST module. Depending on the NAME of the Configuration File specified in Step 3.a, the configuration is written to /etc/booth/NAME.conf. For setups including multiple Geo clusters, it is possible to “share” the same arbitrator (as of SUSE Linux Enterprise High Availability Extension 12). By providing several booth configuration files, you can start multiple booth instances on the same arbitrator, with each booth instance running on a different port. That way, you can use one machine to serve as arbitrator for different Geo clusters. Let us assume you have two Geo clusters, one in EMEA (Europe, the Middle East and Africa), and one in the Asia-Pacific region (APAC). The port used for the communication of the booth instances. The sites belonging to the different Geo clusters that the arbitrator is used for. The port to be used for communication between the booth instances at each site. The configuration files use different ports to allow for start of multiple booth instances on the same arbitrator. The IP address of the machine to use as arbitrator. In the examples above, we use the same arbitrator for different Geo clusters. The IP address used for the boothd on a site. The sites defined in both booth configuration files are different, because they belong to two different Geo clusters. Optional parameter. Enables booth authentication for clients and servers on the basis of a shared key. This parameter specifies the path to the key file. Use different key files for different tenants. The tickets to be managed by booth or a cluster administrator. Theoretically the same ticket names can be defined in different booth configuration files—the tickets will not interfere because they are part of different Geo clusters that are managed by different booth instances. However, (for better overview) we advise to use distinct ticket names for each Geo cluster as shown in the examples above. Optional parameter. If set, the specified command will be called before boothd tries to acquire or renew a ticket. On exit code other than 0, boothd relinquishes the ticket. The service-runnable script referenced here is included in the product as an example. It is a simple script based on crm_simulate. It can be used to test whether a particular cluster resource can be run on the current cluster site. That means, it checks if the cluster is healthy enough to run the resource (all resource dependencies are fulfilled, the cluster partition has quorum, no dirty nodes, etc.). For example, if a service in the dependency-chain has a failcount of INFINITY on all available nodes, the service cannot be run on that site. In that case, it is of no use to claim the ticket. The resource to be tested by the before-acquire-handler (in this case, by the service-runnable script). You need to reference the resource that is protected by the respective ticket. Create different booth configuration files in /etc/booth as shown in Example 4.2, “/etc/booth/apac.conf” and Example 4.3, “/etc/booth/emea.conf”. Do so either manually or with YaST, as outlined in Section 4.3.2, “Setting Up Booth with YaST”. On the arbitrator, open the ports that are defined in any of the booth configuration files in /etc/booth. On the nodes belonging to the individual Geo clusters that the arbitrator is used for, open the port that is used for the respective booth instance. Synchronize the respective booth configuration files across all cluster nodes and arbitrators that use the same booth configuration. For details, see Section 4.5, “Synchronizing the Booth Configuration to All Sites and Arbitrators”. On the arbitrator, start the individual booth instances as described in Starting the Booth Services on Arbitrators for multi-tenancy setups. On the individual Geo clusters, start the booth service as described in Starting the Booth Services on Cluster Sites. To make booth work correctly, all cluster nodes and arbitrators within one Geo cluster must use the same booth configuration. You can use Csync2 to synchronize the booth configuration. For details, see Section 5.1, “Csync2 Setup for Geo Clusters” and Section 5.2, “Synchronizing Changes with Csync2”. In case of any booth configuration changes, make sure to update the configuration files accordingly on all parties and to restart the booth services as described in Section 4.7, “Reconfiguring Booth While Running”. The booth service for each cluster site is managed by the booth resource group (that has either been configured automatically if you used the ha-cluster-init scripts for Geo cluster setup, or manually as described in Section 6.2, “Configuring a Resource Group for boothd”). To start one instance of the booth service per site, start the respective booth resource group on each cluster site. Starting with SUSE Linux Enterprise 12, booth arbitrators are managed with systemd. The unit file is named booth@.service. The @ denotes the possibility to run the service with a parameter, which is in this case the name of the configuration file. After the service has been enabled from command line, YaST Services Manager can be used to manage the service (as long as the service is not disabled). In that case, it will disappear from the service list in YaST the next time systemd is restarted. If you are running booth in multi-tenancy mode as described in Section 4.4, you have configured multiple booth configuration files in /etc/booth. To start the services for the individual booth instances, use systemctl start booth@ NAME, where NAME stands for the name of the respective configuration file /etc/booth/NAME.conf. This starts the booth service in arbitrator mode. It can communicate with all other booth daemons but in contrast to the booth daemons running on the cluster sites, it cannot be granted a ticket. Booth arbitrators take part in elections only. Otherwise, they are dormant. Adjust the booth configuration files as desired. Synchronize the updated booth configuration files to all cluster nodes and arbitrators that are part of your Geo cluster. For details, see Chapter 5, Synchronizing Configuration Files Across All Sites and Arbitrators. Restart the booth services on the arbitrators and cluster sites as described in Section 4.6, “Enabling and Starting the Booth Services”. This does not have any effect on tickets that have already been granted to sites. To replicate important configuration files across all nodes in the cluster and across Geo clusters, use Csync2. Csync2 can handle any number of hosts, sorted into synchronization groups. Each synchronization group has its own list of member hosts and its include/exclude patterns that define which ﬁles should be synchronized in the synchronization group. The groups, the host names belonging to each group, and the include/exclude rules for each group are specified in the Csync2 configuration file, /etc/csync2/csync2.cfg. For authentication, Csync2 uses the IP addresses and pre-shared keys within a synchronization group. You need to generate one key file for each synchronization group and copy it to all group members. How to set up Csync2 for individual clusters with YaST is explained in Book “Administration Guide”, Chapter 4 “Using the YaST Cluster Module”, Section 4.5 “Transferring the Configuration to All Nodes”. However, YaST cannot handle more complex Csync2 setups, like those that are needed for Geo clusters. For the following setup, as shown in Figure 5.1, “Example Csync2 Setup for Geo Clusters”, configure Csync2 manually by editing the configuration files. A global group ha_global (for the files that need to be synchronized globally, across all sites and arbitrators belonging to a Geo cluster). A group for the local cluster site ha_local (for the files that need to be synchronized within the local cluster). 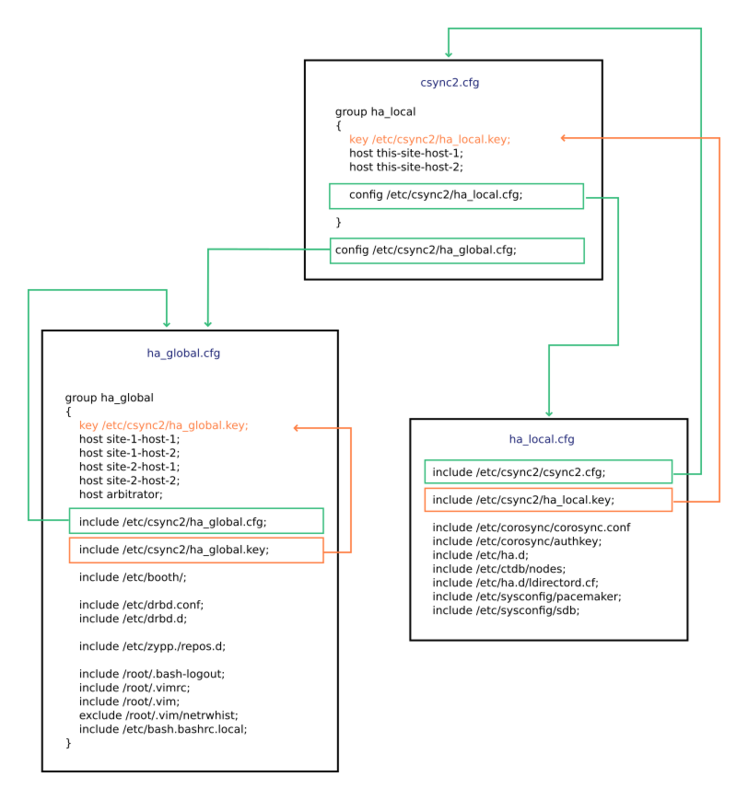 For an overview of the multiple Csync2 configuration files for the two synchronization groups, see Figure 5.1, “Example Csync2 Setup for Geo Clusters”. Authentication key files and their references are displayed in red. The names of Csync2 configuration files are displayed in blue, and their references are displayed in green. For details, refer to Example Csync2 Setup: Configuration Files. The definition of the synchronization group ha_local. The group consists of two nodes (this-site-host-1 and this-site-host-2) and uses /etc/csync2/ha_local.key for authentication. A list of files to be synchronized for this group only is defined in another Csync2 configuration file, /etc/csync2/ha_local.cfg. It is included with the config statement. A reference to another Csync2 configuration file, /etc/csync2.cfg/ha_global.cfg, included with the config statement. /etc/csync2/csync2.cfg, as this file contains the list of the local cluster nodes. /etc/csync2/ha_local.key, the authentication key to be used for Csync2 synchronization within the local cluster. /etc/corosync/corosync.conf, as this file defines the communication channels between the local cluster nodes. /etc/corosync/authkey, the Corosync authentication key. The rest of the file list depends on your specific cluster setup. The files listed in Figure 5.1, “Example Csync2 Setup for Geo Clusters” are only examples. If you also want to synchronize files for any site-specific applications, include them in ha_local.cfg, too. Even though ha_local.cfg is targeted at the nodes belonging to one site of your Geo cluster, the content may be identical on all sites. If you need different sets of hosts or different keys, adding extra groups may be necessary. /etc/csync2/ha_global.cfg and /etc/csync2/ha_global.key (the configuration file for the ha_globalsynchronization group and the authentication key used for synchronization within the group). /etc/booth/, the default directory holding the booth configuration. In case you are using a booth setup for multiple tenants, it contains more than one booth configuration file. If you use authentication for booth, it is useful to place the key file in this directory, too. /etc/drbd.conf and /etc/drbd.d (if you are using DRBD within your cluster setup). The DRBD configuration can be globally synchronized, as it derives the configuration from the host names contained in the resource configuration file. /etc/zypp/repos.de. The package repositories are likely to be the same on all cluster nodes. The other files shown (/etc/root/*) are examples that may be included for reasons of convenience (to make a cluster administrator's life easier). The files csync2.cfg and ha_local.key are site-specific, which means you need to create different ones for each cluster site. The files are identical on the nodes belonging to the same cluster but different on another cluster. Each csync2.cfg file needs to contain a lists of hosts (cluster nodes) belonging to the site, plus a site-specific authentication key. The arbitrator needs a csync2.cfg file, too. It only needs to reference ha_global.cfg though. The same Csync2 configuration is available on all machines that belong to the same synchronization group. The Csync2 authentication key for each synchronization group must be available on all members of that group. Csync2 must be running on all nodes and the arbitrator. However, do not regenerate the key file on any other member of the same group. With regard to Figure 5.1, “Example Csync2 Setup for Geo Clusters”, this would result in the following key files: /etc/csync2/ha_global.key and one local key (/etc/csync2/ha_local.key) per site. Copy /etc/csync2/ha_global.key to all parties (the arbitrator and all cluster nodes on all sites of your Geo cluster). The key file needs to be available on all hosts listed within the ha_global group that is defined in ha_global.cfg. Copy the local key file for each site (/etc/csync2/ha_local.key) to all cluster nodes belonging to the respective site of your Geo cluster. Copy the site-specific /etc/csync2/csync2.cfg configuration file to all cluster nodes belonging to the respective site of your Geo cluster and to the arbitrator. This will synchronize all the files once by pushing them to the other members of the synchronization groups. If all files are synchronized successfully, Csync2 will finish with no errors. ERROR from peer site-2-host-1: File is also marked dirty here! For more information on the Csync2 options, run csync2 -help. Csync2 only pushes changes. It does not continuously synchronize files between the machines. Each time you update files that need to be synchronized, you need to push the changes to the other machines of the same synchronization group: Run csync2 -xv on the machine where you did the changes. If you run the command on any of the other machines with unchanged files, nothing will happen. Apart from the resources and constraints that you need to define for your specific cluster setup, Geo clusters require additional resources and constraints as described below. You can either configure them with the crm shell (crmsh) as demonstrated in the examples below, or with Hawk2. If you have set up your Geo cluster with the bootstrap scripts, the cluster resources needed for booth have been configured already (including a resource group for boothd). In this case, you can skip Section 6.2 and only need to execute the remaining steps below to complete the cluster resource configuration. The CIB is not automatically synchronized across cluster sites of a Geo cluster. All resources that must be highly available across the Geo cluster need to be configured for each site accordingly or need to be transferred to the other site or sites. To simplify transfer, any resources with site-specific parameters can be configured in such a way that the parameters' values depend on the name of the cluster site where the resource is running (see also Chapter 3, Requirements, Other Requirements and Recommendations). After you have configured the resources on one site, you can tag the resources that are needed on all cluster sites, export them from the current CIB, and import them into the CIB of another cluster site. For details, see Section 6.4, “Transferring the Resource Configuration to Other Cluster Sites”. fence: Fence the nodes that are running the relevant resources. stop: Stop the relevant resources. freeze: Do nothing to the relevant resources. demote: Demote relevant resources that are running in master mode to slave mode. On one of the nodes of cluster amsterdam, start a shell and log in as root or equivalent. Enter crm configure to switch to the interactive crm shell. In case ticketA is revoked, the node running the resource should be fenced. If you want other resources to depend on further tickets, create as many constraints as necessary with rsc_ticket. Review your changes with show. The configuration is saved to the CIB. If you have set up your Geo cluster with the ha-cluster-init bootstrap scripts, you can skip the following procedure as the resources and the resource group for boothd have already been configured in this case. params rule #cluster-name eq berlin ip="192.168.202.100"
params config="nfs" op monitor interval="10s"
With this configuration, each booth daemon will be available at its individual IP address, independent of the node the daemon is running on. It defines that rsc1 (which depends on ticketA) can only be started after the g-booth resource group. For any other resources that depend on a certain ticket, define further ordering constraints. After having completed or changed your resource configuration for one cluster site, transfer it to the other sites of your Geo cluster. To simplify the transfer, you can tag any resources that are needed on all cluster sites, export them from the current CIB, and import them into the CIB of another cluster site. Tagging does not create any colocation or ordering relationship between the resources. You have a Geo cluster with two sites: cluster amsterdam and cluster berlin. The necessary resources for booth and for all services that should be highly available across your Geo cluster have been configured in the CIB on site amsterdam. They will be imported to the CIB on site berlin. Log in to one of the nodes of cluster amsterdam. Any resources and constraints of your specific setup that you need on all sites of the Geo cluster (for example, resources for DRBD as described in http://www.suse.com/documentation/suse-best-practices/sbp-drbd/data/sbp-drbd.html). Resources and constraints for boothd (primitives, booth resource group, ticket dependency, additional ordering constraint), see Section 6.1 to Section 6.3. If the configuration is according to your wishes, submit your changes with submit and leave the crm live shell with exit. The command crm configure show tag:TAGNAME shows all resources that belong to the tag TAGNAME. Log in to one of the nodes of cluster berlin. Copy the file exported.cib from cluster amsterdam to this node. When using the update parameter for the crm configure load command, crmsh tries to integrate the contents of the file into the current CIB configuration (instead of replacing the current CIB with the file contents). The imported resources and constraints will appear in the CIB. In case one site of your Geo cluster is down and a ticket failover appears, you usually need to adjust the network routing accordingly (or you need to have configured a network failover for each ticket). Depending on the kind of service that is bound to a ticket, there is an alternative solution to reconfiguring the routing: You can use dynamic DNS update and instead change the IP address for a service. The service that needs to fail over is bound to a host name. Your DNS server must be configured for dynamic DNS updates. For information on how to do so with BIND/named, see the named documentation, or refer to http://www.semicomplete.com/articles/dynamic-dns-with-dhcp/. More information on how to set up DNS, including dynamic update of zone data, can be found in the SUSE Linux Enterprise Administration Guide, chapter The Domain Name System. It is available from http://www.suse.com/documentation/sles. For more information, see the dnssec-keygen man page or the SUSE Linux Enterprise Administration Guide, chapter The Domain Name System, section Secure Transactions. It is available from http://www.suse.com/documentation/sles. Example 7.1, “Resource Configuration for Dynamic DNS Update” illustrates how to use the ocf:heartbeat:dnsupdate resource agent to manage the nsupdate command. The resource agent supports both IPv4 and IPv6. Host name bound to the service that needs to fail over together with the ticket. The IP address of this host name needs to be updated via dynamic DNS. IP address of the server hosting the service to be migrated. The IP address specified here can be under cluster control, too. This does not handle local failover, but it ensures that outside parties will be directed to the right site after a ticket failover. Path to the public key file generated with dnssec-keygen. IP address of the DNS server to send the updates to. If no server is provided, this defaults to the master server for the correct zone. Port to use for communication with the DNS server. This option will only take effect if a DNS server is specified. With the resource configuration above, the resource agent takes care of removing the failed Geo cluster site from the DNS record and changing the IP for a service via dynamic DNS update. Before booth can manage a certain ticket within the Geo cluster, you initially need to grant it to a site manually—either with the booth command line client or with Hawk2. Use the booth command line tool to grant, list, or revoke tickets as described in Section 8.1.1, “Overview of booth Commands”. If the booth service is not running for any reasons, you can also manage tickets manually with crm_ticket or crm site ticket. Both commands are only available on cluster nodes. Use them with great care as they cannot verify if the same ticket is already granted elsewhere. For more information, read the man pages. As long as booth is up and running, only use the booth for manual intervention. The booth commands can be run on any machine in the cluster, not only the ones having the boothd running. The booth commands try to find the “local” cluster by looking at the booth configuration file and the locally defined IP addresses. If you do not specify a site which booth should connect to (using the -s option), it will always connect to the local site. If you do not specify a certain site with -s, the information about the tickets will be requested from the local booth instance. booth: 2014/08/13_10:21:23 info: grant succeeded! In this case, ticketA will be granted to the site 192.168.201.100. Without the -s option, booth would automatically connect to the current site (the site you are running the booth client on) and would request the grant operation. Before granting a ticket, the command executes a sanity check. If the same ticket is already granted to another site, you are warned about that and are prompted to revoke the ticket from the current site first. booth: 2014/08/13_10:21:23 info: revoke succeeded! Booth checks to which site the ticket is currently granted and requests the revoke operation for ticketA. The revoke operation will be executed immediately. The grant and (under certain circumstances), revoke operations may take a while to return a definite operation's outcome. The client waits for the result up to the ticket's timeout value before it gives up waiting. If the -w option was used, the client will wait indefinitely instead. Find the exact status in the log files or with the crm_ticket -L command. The result of this command depends on whether you use automatic or manual tickets. Automatic Tickets. As long as booth can make sure a ticket is granted to one site, you cannot grant the same ticket to another site, not even by using the -F option. However, in case of a split brain situation, booth might not be able to check if an automatic ticket is granted somewhere else. In that case, the Geo cluster administrator can override the automatic process and manually grant the ticket to the site that is still up and running. In this situation, the -F options tells booth not to wait for a response from other, unreachable sites (so ignoring the parameters expire and acquire-after, if defined for this ticket). Instead, booth will immediately grant the ticket to the specified site. Manual Tickets. When using manual tickets, booth grant -F makes booth grant the ticket immediately to the specified site. Before using booth grant -F, make sure that no other site (which is online) owns the same ticket. If the same ticket is granted to multiple sites, resources depending on the ticket might start on several sites in parallel. This results in concurrency violation and potential data corruption. As Geo cluster administrator, you need to resolve a conflict between tickets once the other site is reachable again. In the following sections, find some examples for managing tickets in different scenarios. Wait for any resources that depend on ticketA to be stopped or demoted cleanly. Resources depending on ticketA will automatically fail over to amsterdam in case berlin fails. Wait for any resources that depend on ticket-nfs to be stopped or demoted cleanly. Resources depending on ticket-nfs will automatically fail over to amsterdam in case berlin fails. Let us assume that the (manually managed) ticket ticket-nfs had been granted to site amsterdam (with the virtual IP 192.168.201.100. This site cannot be reached at the moment. Site berlin (with the virtual IP 192.168.202.100) is still available. You will see a warning that the same ticket might be granted to another site, but the command will be executed. It should show berlin as ticket owner for ticket-nfs now. All resources that depend on this ticket will be started on berlin. Granted: Tickets that are granted to the current site. Elsewhere: Tickets that are granted to another site. Revoked: Tickets that have been revoked. Additionally, Hawk2 also displays tickets as revoked if they are referenced in a ticket dependency, but have not been granted to any site yet. Though you can view tickets for all sites with Hawk2, any grant or revoke operations triggered by Hawk2 only apply to the current site (that you are currently connected to with Hawk2). To grant a ticket to another site of your Geo cluster, start Hawk2 on one of the cluster nodes belonging to the respective site. You can only grant tickets that are not already given to any site. Start a Web browser and log in to Hawk2. In the left navigation bar, select Monitoring › Status. Along with information about cluster nodes and resources, Hawk2 also displays a Tickets category. It lists the ticket status, the ticket name and when the ticket was last granted. From the Granted column you can manage the tickets. To show further information about the ticket, along with information about the cluster sites and arbitrators, click the Details icon next to the ticket. To revoke a granted ticket from the current site or to grant a ticket to the current site, click the switch in the Granted column next to the ticket. On clicking, it shows the available action. Confirm your choice when Hawk2 prompts for a confirmation. If the ticket cannot be granted or revoked for any reason, Hawk2 shows an error message. If the ticket has been successfully granted or revoked, Hawk2 will update the ticket Status. Hawk2's Batch Mode allows you to explore failure scenarios before they happen. To explore whether your resources that depend on a certain ticket behave as expected, you can also test the impact of granting or revoking tickets. From the top-level row, select Batch Mode. In the batch mode bar, click Show to open the Batch Mode window. Click Inject › Ticket Event. Select the Ticket you want to manipulate and select the Action you want to simulate. Confirm your changes. Your event is added to the queue of events listed in the Batch Mode dialog. Any event listed here is simulated immediately and is reflected on the Status screen. Close the Batch Mode dialog and review the simulated changes. To leave the batch mode, either Apply or Discard the simulated changes. For more information about Hawk2's Batch Mode (and which other scenarios can be explored with it), refer to Book “Administration Guide”, Chapter 7 “Configuring and Managing Cluster Resources with Hawk2”, Section 7.9 “Using the Batch Mode”. Booth uses the same logging mechanism as the CRM. Thus, changing the log level will also take effect on booth logging. The booth log messages also contain information about any tickets. Both the booth log messages and the booth configuration file are included in the crm report. In case of unexpected booth behavior or any problems, check the logging data with sudo journalctl -n or create a detailed cluster report with crm report. If the issue is about booth only and you know on which cluster nodes (within a site) booth is running, then specify only those two nodes plus the arbitrator. However, it is preferable to produce one single crm report for all machines that you need log files from. For instructions on how to upgrade the cluster nodes, refer to Book “Administration Guide”, Chapter 5 “Upgrading Your Cluster and Updating Software Packages”. The chapter also describes which preparations to take before starting the upgrade process. It provides an overview of the supported upgrade paths and where to find the details for each step. If you use an arbitrator outside of the cluster sites, upgrade the arbitrator as described in Procedure 10.1. Perform an upgrade to the desired target version of SUSE Linux Enterprise Server and SUSE Linux Enterprise High Availability Extension as described in Book “Administration Guide”, Chapter 5 “Upgrading Your Cluster and Updating Software Packages”. Check if you have enabled the modules and extensions mentioned in Article “Geo Clustering Quick Start”, Section 3 “Requirements”. More documentation for this product is available at http://www.suse.com/documentation/sle-ha-geo. For example, the Geo Clustering Quick Start guides you through the basic setup of a Geo cluster, using the Geo bootstrap scripts provided by the ha-cluster-bootstrap package. A document with detailed information how to on data replication via DRBD across Geo clusters has been published in the SUSE Best Practices series: http://www.suse.com/documentation/suse-best-practices/sbp-drbd/data/sbp-drbd.html.